HOUSTON & PONTE VEDRA, Fla.--(BUSINESS WIRE)--Apr. 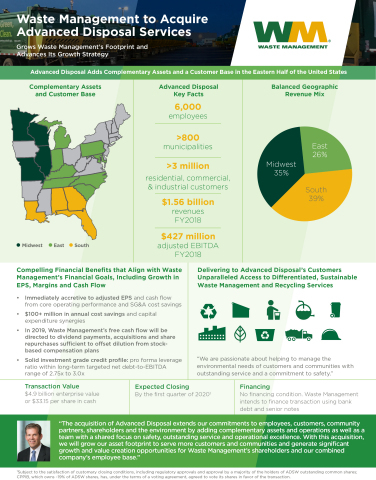 15, 2019-- Waste Management, Inc. (NYSE: WM) and Advanced Disposal Services, Inc. (NYSE: ADSW) announced today that they have entered into a definitive agreement under which a subsidiary of Waste Management will acquire all outstanding shares of Advanced Disposal for $33.15 per share in cash, representing a total enterprise value of $4.9 billion when including approximately $1.9 billion of Advanced Disposal’s net debt. The per share price represents a premium of 22.1% to Advanced Disposal’s closing share price as of April 12, 2019, the last trading day prior to today’s announcement, and a premium of 20.9% to Advanced Disposal’s 30-day volume weighted average price as of the same date.